Increase impulse sales of to-go items at grocery stores or showcase culinary creations at catered events with this Visions 16" clear PET round catering tray dome lid! Boasting a crystal-clear design for optimal visibility and fast product identification, this dome lid is perfect for covering deli meats and hors d'oeuvres. It will easily snap onto your 16" catering trays with a secure seal and can even be stacked for compact storage, transportation, or display. This lid is pretty sturdy, handling a some medium heavy objects falling on it without any sort of issue. We find that they hold up and lock very well. I use these with the 16" Thermoform Catering/Deli Tray to as cookie platters. The 16" nicely displays up to 3 dozen 3" sugar cookies without having to crowd the tray. The lid can be a bit difficult to remove. These quick-on catering tray lids are a breeze to put on and take off - without cracking. We love how professional the trays look when they leave our bakery with our customers. I highly recommend these lids with the matching bottoms. I use these for my large cookie trays and fit 12 dozen of cookies on this tray size. Top seals tight. Fits base. Nice small size for 8-12 sandwiches. Great for medium catering job. When I removed top turned over and top was great to hold chips. If you purchase the 16” catering trays then this lid is a must have! This particular one is a high-dome which worked out better for our needs. We used these lids to cover meat/cheese platters, veggie platters and etc for a recent event. They snap on easily to the trays found on this site and creates a deal to protect your food. These high dose lids fit snuggly onto the catering trays that we purchased from here as well. Made for a beautiful presentation on dessert trays and condiment trays for a recent event. Great quality for the price, the plastic is extra clear, we used it for sushi roll catering and rally delivered, love the matching black tray. Perfect! High dome is great for bigger food items and even better for double stacking small or finger foods. Can’t find lids this size in store. Lids fit on the bases with minimum effort. Strong enough to support stacking containers on top of each other. Case received with no damaged or dented lids. These lids are fantastic for our catering. Whether it be a veggie, fruit, or sandwich tray, these lids give us freedom to transport and easily display our food at any catering job. we use these for all bakery orders. cookies, muffins , etc. work well and we don't have issues with trays and lids becoming disconnected. great product. These are really great, tall lids for the catering. I used the Visions Black Tray. They fit perfectly. They can be used for cold sandwiches, cookies and other bakery items. There’s a perfect little circle for a logo/label right in the middle. I even wrap them with ribbon for extra special gifting solutions. We use the high dome lid for cookie trays, so that we can fit approximately 60 average size cookies on the 16" tray. Seals tightly and stacks well. 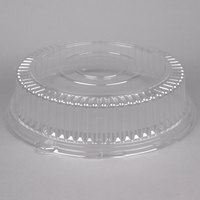 These dome lids are a great way to be decorative and also cheap with your catering. You can afford to give them away but they still look great! This lid is a great height for fruit and dessert orders. They lock securely in place and don’t crack easily. I also like how they stack for easy storage. These lids fit perfectly with the vision trays that we purchased. They snap on easy and are easy to take off, which is important for our catering business. The clear lid allows customers to view our product upon arrival, which is also a plus. The lids are sturdy and of good quality. We have ordered these in both the 16" and the 18". Would recommend this product. This dome is a perfect way to cover and protect your catering food. The bases that come with it are excellent and provides great contrast. Preferred product for all of our Tray needs. It attaches to the associated deli tray and brings professionalism to the product with a nice clean look. Highly recommend. we use these to do our to-go catering orders. They stay secure on the bases and allow our customers to see the product without having to open them. Nice catering tray lids! They seem sturdy and snap on well. No complaints - we will continue to order this product as we need more. These lids snap on quickly and tightly. They are easier than other lids we have had, and never fall off when you aren't expecting it. The tight seal also keeps our hot sandwiches warm just a little longer. These 16" lids work well with the 16" trays they are not as tall as I'd like. They work as described and have a nice solid snap to them. I purchased this item because I am an avid baker. The lids I've purchased in local party stores just didn't work well for me. They were not as nicely made and never snapped on easily. These lids are sturdy and work just wonderfully. I will definitely be purchasing this item again. Clear lid for the catering tray. This lid works well because it displays the product well. You can easily see what's in the tray and you also can write on it with a marker to label what's in it. We use these platter lids for our different medium sized trays when we cater events. They work very well, look nice, and are packaged well when they're shipped to us. These lids work perfect with the Catering Tray and are the perfect height for our Sub platters! They are also a great price compared to our vendor pricing and local wholesaler store. We love these trays with lids. The lids are deep enough to allow for a lot of treats to pile up and they snap down very well. These are a great size. I prefer the high dome cover. I use them to cover my King Cakes for Mardi Gras, deli sandwich platters for catering and using them for a sweets platter with a variety of treats. They are of good quality. We love these! So much more affordable than our local restaurant supply, and we had a hard time finding high domes locally! Great quality and affordable! These lids fit the bottoms very well. They are very thick & crisp clear. I use to do cookie platters. They present my baked goods very lovely & more important. Extremely secured in a tight snug click to the fitted sized bottom. Great item! Perfect thickness and height for clearance of multiple items. Perfect for cup cakes, cookies, cake pops or even fruit and veggie trays for all occasions. These lids have more than one use! We flip them over and are the perfect size for our Caesar salads. The clear dome compliments the beautiful greens inside and our customers love the presentation. We use these 16" catering tray lids with our bigger catering orders and they beautifully display the food, are easy to put on and take off and fit the trays perfectly. Great price for a great quality cover. These covers fit securely and snap on and off easily. Perfect for catering deliveries. We use these all the time. Lids break or are just too hard to handle but I personally love these because they don't give me a headache just trying to figure out how to close it,i highly recommend them. These domes are made with a great quality plastic, see through and sturdy. The product can be clearly viewed once the done is snapped on. Dome DOES snap on and off without cracking if it's taken on and off !! These lids securely fit the plastic trays. They snapped into place and I didn't need to worry about the food spilling. High Quality! Definitely worth the price. Clear view which provides good presentation. Easy to store in a crowded kitchen. I am storing 3 different sizes with their tray all in one box. Sturdy construction. Relatively cost effective for any application. We use them for sandwiches and desserts. I used these lids with the suggested tray for holiday cookie platters. They are sturdy and locked securely to the tray, I was able to stack 25 trays full of cookies with no problem.. I will stick with this style and brand. Really how well the lid holds on to the black tray. A very sturdy design, look very professional at our catering events. Clients love them. I found these lids to be a little delicate for my preference. They didn't snap into place easily and were a thin plastic so you have to be careful. All around a good price for the value though. Great product. Far better price than what I pay locally. Same or even better quality. I love the way the lid clicks around the tray. If it has to be reopened, it does not crack. The lid perfectly fits the container and makes it air tight. Very easy to close the lid and received positive feedback from customer as well. We use these 16" High Dome Lids for our larger sized party / catering trays. They provide plenty of room for us to pile up our bagels and large baked goods. Great quality and easy to snap on / off. Along with the catering tray, they make a great, classy, disposable option for lunch catering. we use them almost every day and they do not disappoint. These lids not only protect my muffins and cupcakes but showcase them as well. I love them! I would definitely recommend them and the coordinating trays.